Canine Distemper Virus is a highly contagious virus that affects the respiratory and nervous systems, causing fever, coughing, vomiting, diarrhea, seizures, and eventually death. Canine Parvovirus and Coronavirus are also highly contagious and cause severe vomiting and diarrhea, often leading to death. They affect dogs of all ages, puppies most severely. Symptoms include diarrhea, vomiting, excessive thirst, weight loss, listlessness, and loss of appetite. Parvovirus and Coronavirus can occur simultaneously, making the symptoms more severe. Canine Parainfluenza and Adenovirus cause highly contagious respiratory diseases leading to a dry, hacking cough. 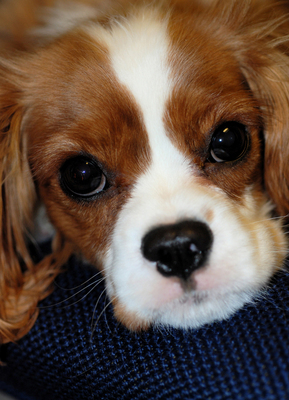 It is very serious in puppies and can lead to a more severe pneumonia. There is a second form of adenovirus that causes serious liver disease. Canine Leptospirosis is a bacterial disease that impairs renal function and may result in kidney failure. Symptoms include vomiting, impaired vision, and convulsions. The disease is transmitted by contact with the urine of infected animals (other dogs, but also rodents, deer, wildlife) or by contact with objects that have been contaminated with the urine of infected animals. Kennel cough is an airborne complex with bacteria that is highly contagious. It causes a deep pronounced cough that last a long time. Bordetella (kennel cough) vaccine is strongly recommended in dogs that visit the groomers or that board frequently. It is also required in puppies that will be going to training classes and that will begin going to the groomers. Rabies vaccine is required by law and here in Ohio is strictly enforced. Please visit our page on rabies for more information. Lyme Disease is a tick borne disease that has been spreading and has become an increasing concern in many areas. The disease can cause a wide range of trouble, from flu-like symptoms to permanent joint problems. The need to vaccinate will depend on the places a pup may travel to or potential exposure to ticks. Sometimes puppies will be started on their vaccinations earlier than 8 weeks of age, sometimes as early as 6 weeks. The sequence of their boosters will be adjusted accordingly. It is important though that they be very close to 16 weeks or older at the finish of the series to ensure adequate duration of protection. Suggested Vaccination Schedule for Puppies.